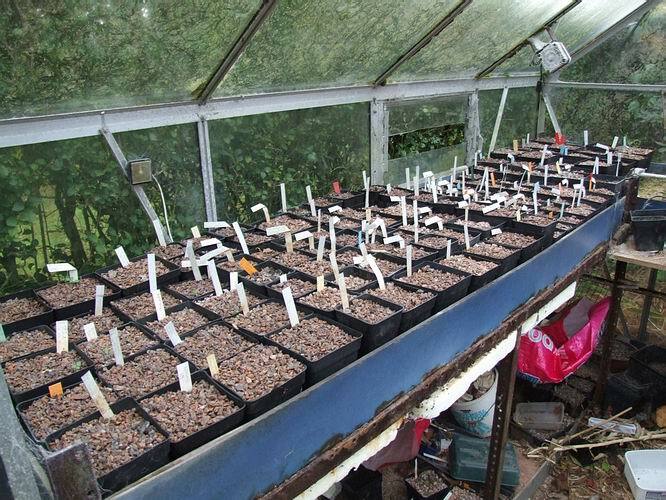 It was only the other week that I said due to the cold conditions I would not need to water the bulbs again for a while. 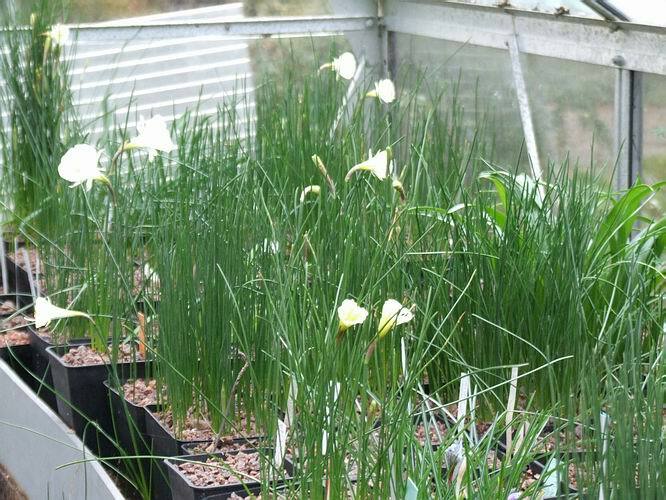 Well the plants are now telling me a different story - this Narcissus is flopping and needs watering now. Our climate is so fickle; one day we can have severe frosts and the next we can have temperatures into double digits. It is the effect of being on a small island, each change of wind and each new Atlantic front brings swinging climate conditions. People with more stable continental climates must wonder why we are so obsessed with the weather but it can change very quickly. 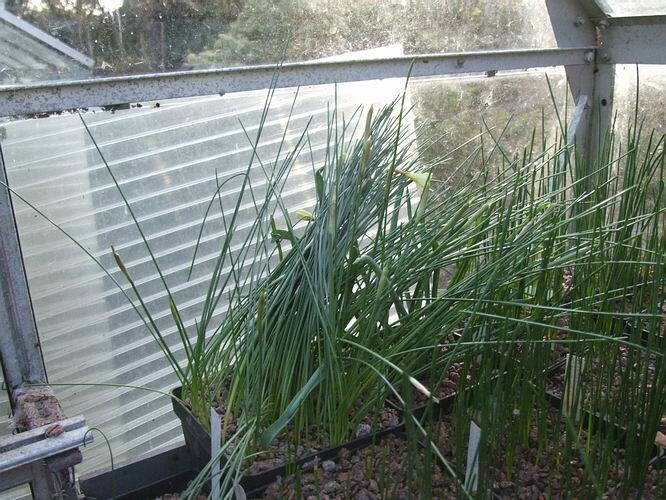 ld conditions from October, most of the narcissus did not flower until February, March or even April. 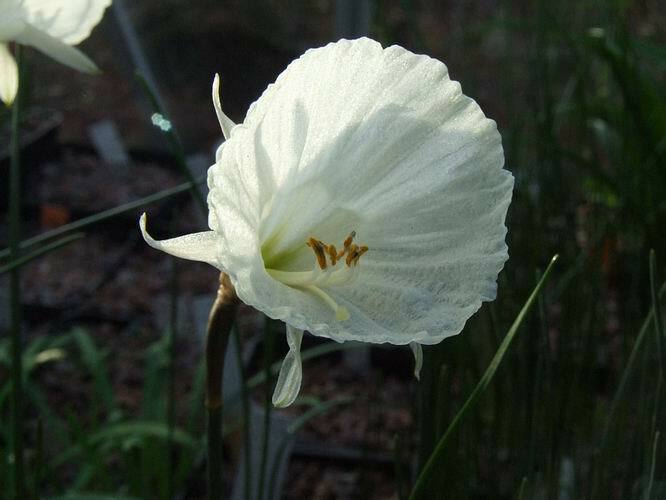 I can remember putting Narcissus 'Camoro' onto the Show bench in late March one year and it is coming into flower now. It is also interesting to observe how the leaves appear in a pot in this case it is the ones around the edges that have appeared before the ones in the centre. Is this because it is warmer around the edges or that more moisture is available? It is easy to speculate but the answer can be more complex as other factors that we may not have considered also come into play. 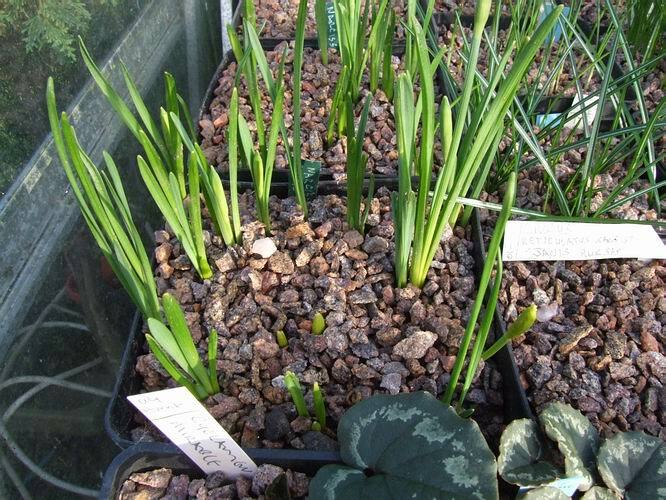 The pattern of growth is quite different in this adjacent and identical potful - the centre bulbs seem to be ahead of many of the outside ones. We must always keep a very open mind and weigh up all the factors before we jump to any conclusions. 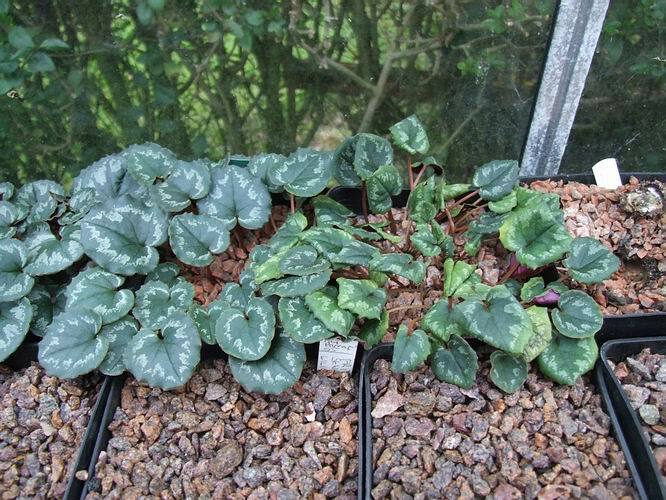 Last week I showed the flopping discoloured leaves on this cyclamen. After a good watering some of the leaves have perked up a bit but it is still not looking healthy. I will leave it for the rest of this week but if there is no improvement I will have to look more carefully at what is going on below the gravel. The bulbs speak to us through their leaves if we can understand what they are telling us. 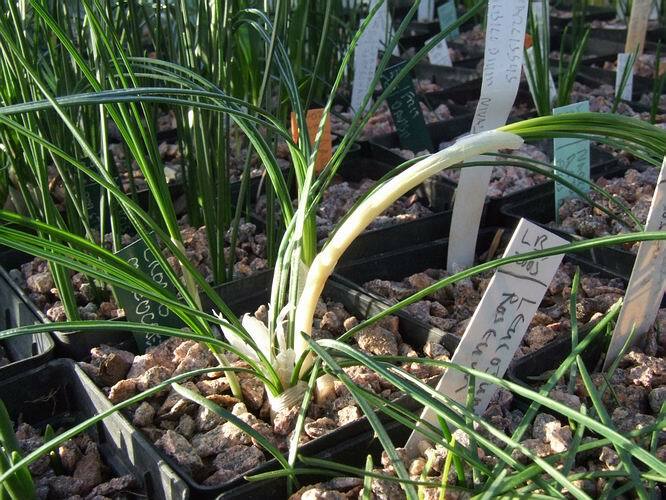 Floppy limp leaves are a sign of lack of water, what do the crinkled leaves on this crocus indicate? This condition was discussed recently on the forum and although virus was mentioned as a possibility the general consensus was that it was just a physical problem of the leaves trying to push clear of the bracts. 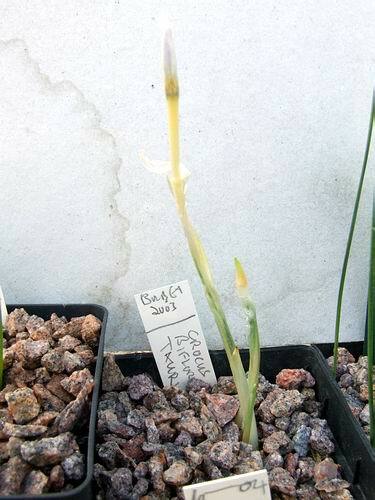 Another example of strange growth in crocus is this persistent bract where the bract just keeps growing for some reason. It could just be a simple mutation as the plant looks completely healthy apart from the elongated bract. However I am not so sure about this crocus that I got at a bulb exchange. The bract has become very tough and the leaves and flower are struggling to break through and there appears to be some discolouration on the leaves. I have removed it to a place of quarantine where I can keep a close eye on it and will report back in a future log. 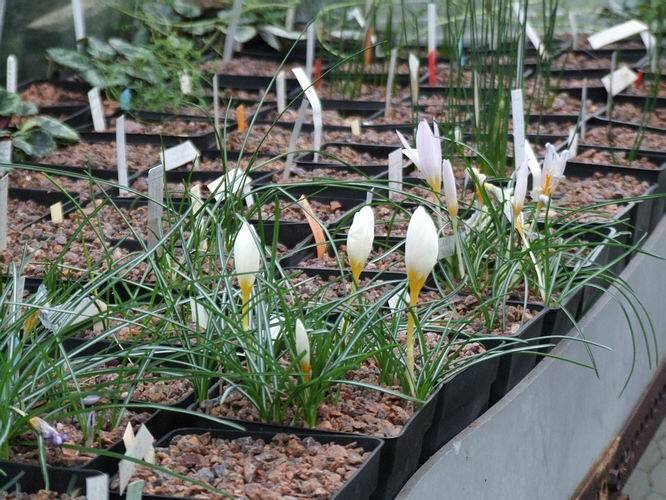 There are plenty of healthy crocus leaves in the bulb house and still some crocus flowers such as a late flowering Crocus hadriaticus in the foreground. 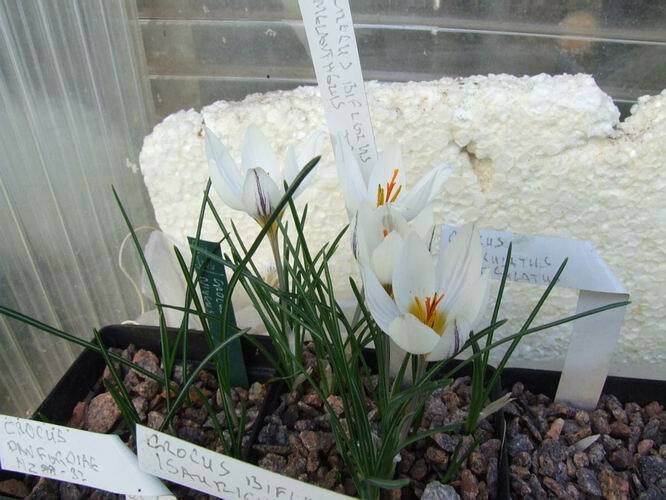 Crocus biflorus melantherus is producing yet another flush of flowers. I think this is the third successive set of flowers form this small potful. 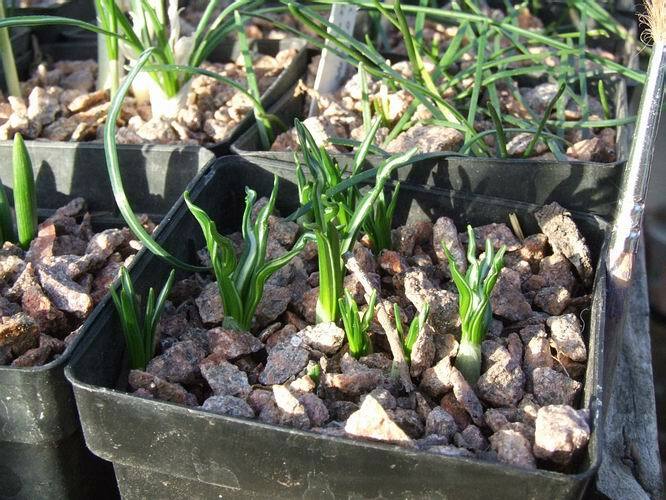 In the Fritillaria house all is quiet and I do not have to do any watering as the only loss of moisture from the pots is through evaporation. I must make sure that they do not dry out completely though as they will have roots growing and the growth point will be slowly extending. 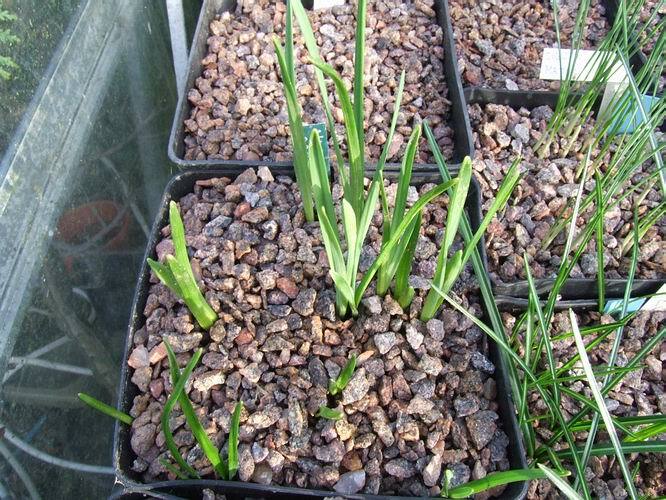 The difference between the frits and the narcissus just illustrates to me how much moisture is used up by the plants when they are in full active growth as compared to when they are semi dormant. 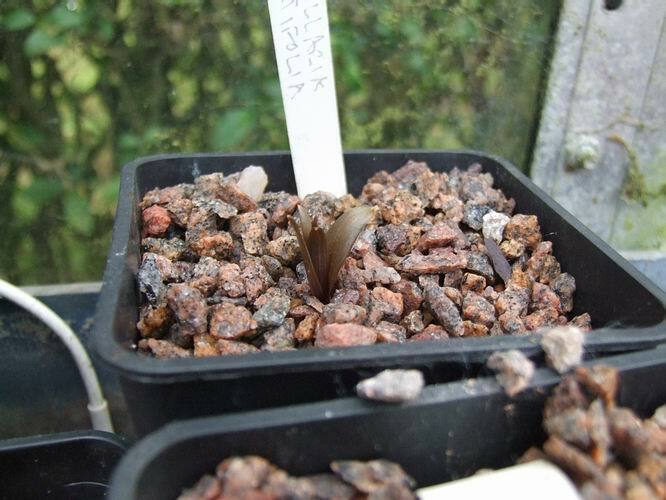 As I look around I did find one adventurous Fritillaria tortifolia just showing above the gravel. Finally another warning that these damp conditions are perfect for the moulds to form can be seen in this picture where the pollen is being attacked by mould.